Endeavour Education Support Centre opened in January 2000 and is situated within Endeavour Primary School in Port Kennedy. The Education Support Centre and the Primary School work very closely together and operate under the collective name of “Endeavour Schools”. Our Education Support Centre consists of four air conditioned state-of-the-art teaching areas; a therapy room; a bathroom area; administrative office and life skills room. Each teaching area is dedicated to a specific year level, namely Early Intervention, Junior, Middle and Upper Primary. All four classrooms are located alongside the Primary School’s classrooms to ensure that our students are working together with their mainstream peers. We run a range of integrated and inclusive programs across the ESC and Primary School and regularly share facilities and resources to accommodate the needs of all students across both schools. Endeavour is the first school designated as ‘low allergen’ in Western Australia. The buildings and landscaping have been constructed so as to lower the incidences of bronchial related illnesses in children such as asthma. The design includes the use of whiteboards instead of chalkboards to reduce dust caused by chalk; environmentally friendly heating system; ducted cleaning system and reduced airborne pollination garden designs. All our staff have specialised qualifications in the area of special education. Teachers are committed to achieving the best outcomes for students and have become part of the ‘Endeavour Team’. One of the critical factors in the success of any integration program is the relationship that exists between the ESC and the Primary School. At Endeavour we have created a unique situation, in that parents and administrative staff from both schools have been involved in all aspects of planning from the very beginning. This has afforded many opportunities to develop strong relationships and shared educational understandings with a commitment to the process of integration. This has led to a shared School Board, shared staff and resources, common phone lines and joint plans and policies. We also run a whole school Sports Ability Program to teach able children how to adapt sporting games for people with a disability. Here at Endeavour we are able to offer a number of different therapy programs that are tailored to suit the needs of individual children. We implement specialised individual therapy programs for students with speech, occupational therapy and physiotherapy needs, conducted by experienced staff in collaboration with Rocky Bay SATS. Individual therapy programs are also run for students with specific needs in areas of sensory disorder, motor dyspraxia, verbal dyspraxia, communication difficulties and devices, anxiety conditions, personal safety (protective behaviours) and personal hygiene. Endeavour prides itself on having the latest technology in the use of ‘Neo Smarts’ or portable note takers for students with weak fine motor skills. Neo Smarts allow students to complete work independently without the use of spell check or built in dictionary. Children type their work as if they were writing and are easily transported from one class to another. All children from Years 1-6 are also educated in the use of latest technology through iPads, interactive whiteboards, laptops and computer labs. Endeavour ESC provides learning programs for primary aged school students. 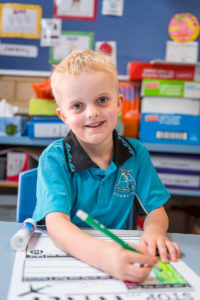 The teaching staff work in conjunction with School Aged Therapy Services, the School Psychology Service and other related agencies to provide each student with an individualised and comprehensive education program. Specifically designed to cater for the needs of young students in kindergarten and Pre-Primary. The program incorporates aspects of fine motor and gross motor skills as well as a focus on developing effective communication and interactions skills. These transition years from Early Intervention to Senior Primary provide opportunities to identify individual needs more closely. Programs focus on both school and individual priorities. Students have opportunities in the senior program for a fully inclusive model of education. If appropriate for individuals, they may spend all of their time in a mainstream classroom with individual support from ESC teachers and assistants. We also have transition programs running throughout Year 6 in order for students to experience the new environment and expectations of High School.